The 2018-2019 ice-fishing season was a strange one. Both the best and worst year on record. Some background. My family has been fishing the Great Sacandaga Lake in NYS for some time. Both my Grandparents had places on the lake, and my brother (Ray) and I spent our youth there. Swimming, Fishing, Snowmobiling, etc. All the fun lake activities. About 12 years ago, we both ended up buying ‘campers’ in the same seasonal RV park on Sacandaga. We had a blast there with our families, and always used that as our 'home base' for our ice-fishing. The park was in Mayfield, and the owners/management let us keep our Shanty and snowmobiles there, and had no issues with us going up there in the Winter time. No frills, but again, it served as a great home-base, and we spent just about every weekend ice fishing around the 'southern basin'...Sunset Bay, Trap Islands, Beacon, etc. Some success, some slow days. Our goal has always been big Pike. We do quite well in the spring and the fall (especially my brother), and have multiple 40”+ Pike caught over the years. My personal best was 46”, Ray’s-45”, although he’s caught much-more trophies than I have. 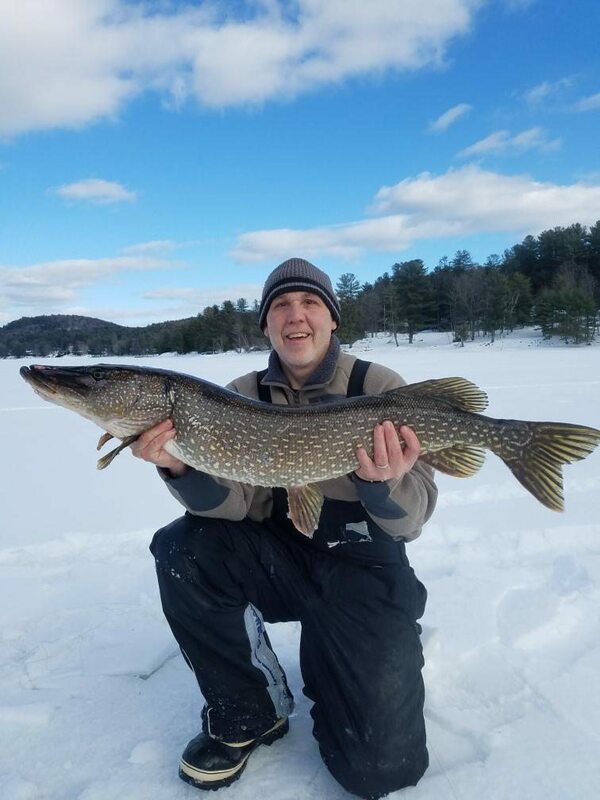 My brother also landed a 41” Pike ice-fishing on another lake, but we never managed to pull a trophy pike through the ice on the Great Sacandaga. Fast forward to the summer of 2018. The RV park decided to close the park to all campers from October-April. For us, that just wasn't an option. We both enjoyed the winter as much as the summer, and it was time for a change. I ended up buying a camp towards the Conklingville Dam (north-end). My brother ended up around Diamond point (southern end). I was the first to leave the campground, and we decided to move our beloved Shanty to my camp this year, and we would alternate locations going forward. To make matters worse, one of my neighbors (Gary) wandered out on the ice that day. He's a full-time resident up there, and was reminiscing about the time "someone caught a 33" Northern in the next cove over, 10 years ago". That didn’t seem too encouraging to us. That he can remember the one time, that someone caught an average Pike since he’s lived there, and Gary is an old-timer. A couple of weeks later, once the lake was deemed “Shanty safe”, we mobilized and it was time to drag it out. 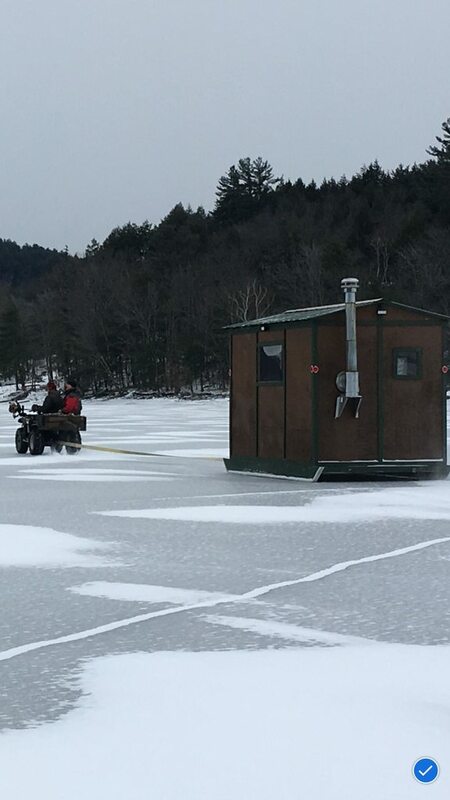 Moving the Shanty out on the lake is definitely a highlight for us each year. The start of the season, endless possibilities. Not knowing where to put it, we picked a random spot that looked ‘fishy’, and moved her into position. It was a dubious start for us that day. We ended up fishing there all day, and got skunked. And just like when Gary walked over and gave us discouraging news, sure enough, two more old-timers walked over to say hello. After some small-talk, we asked them how’s the fishing here. They were very enthusiastic, and said the fishing is great, lots of Walleye caught here. We then asked about Pike. Their response, “nope, never caught a pike here, ever”. Our hearts sank. Just a side-note on the Shanty. For every fish we catch, we always write it on ‘the wall’. “The wall” being the inside walls of the Shanty. For each year, we pick a section, and write down the date, time, weather conditions, who caught it, the species and length. Needless to say, nothing was wrote on “the wall” that weekend, nor the next few weekends that followed. This new spot was looking like a bust, and the north-end wasn’t looking good for us at all. At this point, it’s time to relocate the Shanty, but mother nature had something to say about that. We had a couple of big storms, lots of snow, then the thaw, then the slush, then the ice. 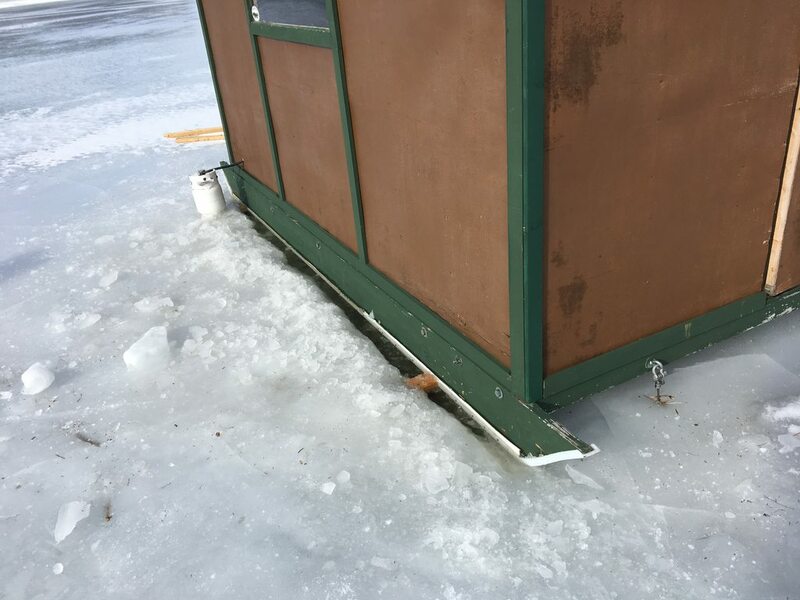 We normally stay on top of our shanty maintenance (keeping it high off the ice on blocks) but between other plans, and the weather, the skis were hopelessly frozen into the lake, So I went up to the lake one Saturday (my brother had other plans), put out some tip-ups and started to chop out the shanty. All day I chopped the ice, all day I fished. When I left that day, I was sore, the shanty was still frozen into the lake, and not a single flag. Of course, nothing was added to ‘the wall’. The following weekend, was attempt number two to free the shanty. This time we armed ourselves with 50lbs of rock salt, a hydraulic jack, another heavy duty car jack, two ice-bars and two augers.. We were on the ice after all, so we put out 14 tip-ups and started to work. It was a beautiful day, around 30degrees, mostly sunny, with an occasional breeze. Not a bad day to work, and go fishing as well. I think we started around 9am that day. By around 1pm, the shanty was finally free. Fishing wise, the highlight was when one flag went up around 10ish, but it was a bait flag. At this point, we were both exhausted, hadn’t caught a fish all day, and decided to pack it in, and pull the shanty to another location. At around 2pm, just when we were packing up, a flag went up. It was actually the same tip-up that went up earlier that day, so our enthusiasm was somewhat diminished. As I walked over to the flag, my brother followed. Normally, our pace would be quicker, but we were both beat and not too optimistic. I wanna stay the reel was spinning slowly when we arrived at the hole, but my memory fails me on that detail. One thing I do remember is taking it, and feeling instant weight when I set the hook. I could tell it was big, and she ran hard. The fight was on. She took line, then I retrieved, back and forth we went. As she ran, i used my fingers as the drag, never letting the line get too tight, and never giving her slack. This went on for some time. Finally, I saw her at the hole. It was a huge pike. I use an 8” auger, my brother uses 10”. 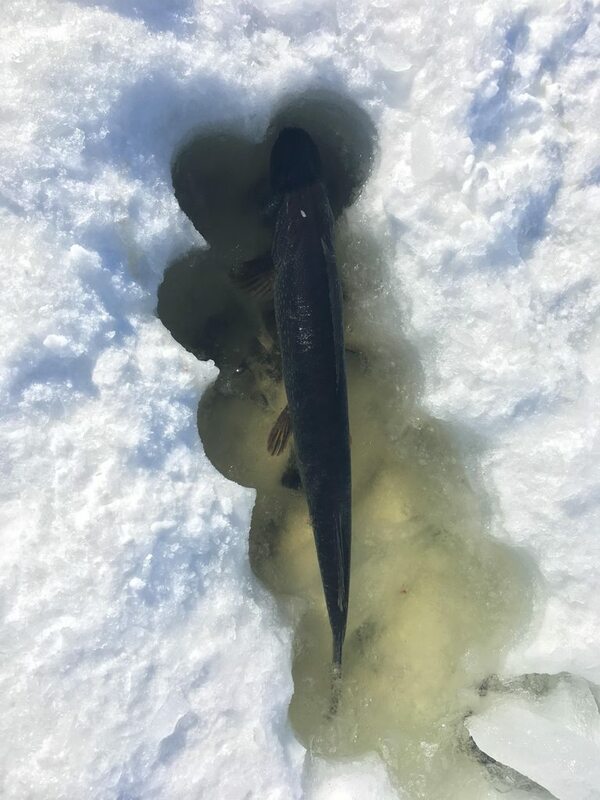 This was an 8” hole, and seeing her underneath the ice, she looked like she was wider than the hole itself. Once she saw the light of day, she ran even harder. The back and forth went on at least five more runs. It was the type of fight i dreamed of, the reason why we ice-fish. After a prolonged battle, she was finally exhausted. Now we had to figure out how to bring her on the ice. As she sat there motionless under the hole, she was still horizontal, and looked enormous. Fish under water always look bigger than on land, and she looked huge! I tried numerous times to get her vertical, but she wasn’t too keen on that. A couple more half-hearted runs, and she started to turn upright. It was still a daunting task to get her on the ice though. At one point, her bottom jaw was locked on the underside of the ice, and just wouldn’t budge. The only thing i could do was give her some more line, let her sink again and bring her up. After a few attempts at this, she was finally in position, and began to pull her up. Admittedly, we used a gaf to assist. We practice catch and release, but we needed to land this fish. My brother put the gaf down the hole and got her on the lip. Just enough to bring her up. I still have the mental image of her coming through the hole. Her girth filling every inch of that 8” hole, and seemed like she just kept coming. What a sight. And then seeing her finally on the ice. Small and medium pike, like most fish, tend to flap around. She was so big she didn’t really flap, but flex. Hard to describe, but just slow, muscular movements, flexing her girth back and forth. We did it! We finally landed a trophy pike, through the ice, on the Great Sacandaga. We jumped, we high-fived, we hugged. Just an exciting moment. When we measured her, she was 41.5”. North of the 40” mark, and that’s all we needed to know. We didn’t weigh her since we didn’t want to put more stress on the fish. After getting the hook out, it was time to let her free. She was still in good health, although pretty tired, and as soon as her head went down the hole, she got a second wind and we could see her dart towards the cold depths. Needless to say, the fish and the record of her, went on “the wall”. So for the season to date, we had only one entry on “the wall’, Tom-Pike-41.5”. We stayed and fished for a little longer that day, but didn’t catch anything else. One trophy pike certainly made our day, and frankly, the season. My brother put it best, paraphrasing here, but he said “that fish was significant in more ways than one”. 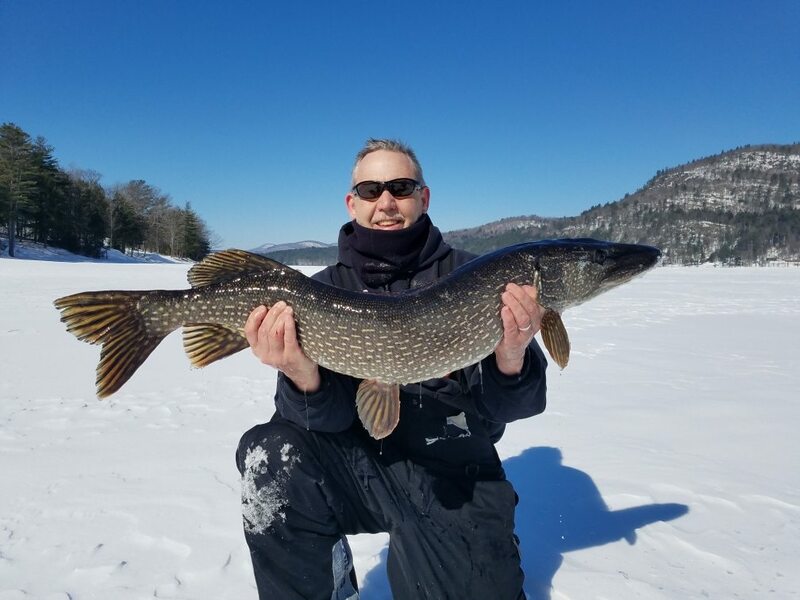 He was right, it was our first 40”+ pike through the ice on Great Sacandaga. It was a pike where multiple people said there were no Pike. It was caught on the northern end, across the lake from my new camp. It was a fish we caught together, after countless attempts. I would agree, very significant. Here’s where the sorry gets a little stranger.. A couple weeks after, it’s time to bring the shanty in for the season. We agree to meet at my camp on a Saturday morning and begin the process. Same crew. Myself, Ray and Eric. I spent the night prior at camp, having a few bourbons, staring at the fire, and thinking about big Pike. When i woke up that morning, I decided to head out a little early. I threw my gear on the wheeler, pulled out a snowmobile for them to use, and texted them that I’d meet them out there. It was a beautiful day. Sunny, warm for March and hardly any wind. I set up my seven tip-ups along shore (probably 300 yards from the shanty) and then drove back to the shanty to start prepping for the move. As soon as I got off my wheeler to drop off the bait bucket, I scanned my tip-ups and noticed a flag. Nice start I thought. I got back on the wheeler, drove over to the flag and immediately noticed the reel was ‘burning’. The tip-ups I use are called ‘Fishcrafters’. They were made back in the 50s, and have little ‘trip flags’ (at least that’s what i call them). So as the reel spins, there’s a small flag on the trip mechanism that flips back and forth. The little trip flag was flipping like crazy as I approached, and took it almost immediately. Just like before, when I went to set the hook, I could feel the weight. I won’t go into all the details, but I eventually landed her. When she was finally on the ice, I could tell it was bigger than the 41.5” I caught a few weeks prior. Both longer and heavier. At this point, I wanted to show my brother and cousin the fish I landed. After removing the hook, I took my auger and drilled 5-6 holes back to back and built a small live-well for her. I scrambled to clear out the ice shavings and slush, and laid her in the well to recover. While she was safe in the first live well, I then proceeded to build a more elaborate one. This time, two eight-inch holes wide, and 6 holes lengthwise. I scrambled to chop out the remaining ice with the ice-bar, and furiously scooped out all the ice shavings. I then punctured the ice, and the water started to flow in. I now had a beautiful live-well for my trophy, and moved her over. She looked quite healthy, staying upright, pectoral fins moving, and I like to think she actually enjoyed the nice warm sunlight on her back. I hadn’t measured her at this point, and wanted to wait until my comrades arrived. I couldn’t wait to show her off. About an hour later, i hear a snowmobile approaching. It’s Ray and Eric. Considering I was still 300 yards from the shanty, and hanging out by my tip-ups, they assumed I caught something. They rolled up and said something like “did you catch something”? As I stood there, I just smiled and nodded confidently. “Catch another Pike?”, my brother asked. I just nodded again. “Big as last time”, he prodded. “Bigger”, I said. And then just pointed to the live-well. They both jumped off the sled and walked over. The look on both of their faces was priceless. “HOLY SH.T!” they both shouted. What a great moment. We eventually measured her at 43”. After the measurement, we set her free to enjoy the spawn, and fight another day. We fished some more that day. Eric caught a small pike, Ray didn’t catch anything. So for the year, ‘the wall” read Tom-41.5”-Pike, Tom-43”-Pike, Eric-20”-Pike. Those were the only entires for the entire year. Like i said, the best year and the worst year all in one. My poor brother never got on the wall for the entire year, first year ever, but i think he was pretty happy with the results. Awesome story! For someone that rarely gets a chance at a pike any time of year, that was entertaining. Thanks for sharing. Thor, thanks for the read! Awesome, thanks for sharing that story! I had to keep myself from scrolling down to look before I was done reading ! Awesome story Are you going to keep fishing the North end??? Thor94 thank you for the story and photos congratulations on the northern pike. May your brother and cousin Eric catch similar sized fish through the ice next year. Since Great Sacandaga is a reservoir water levels will be different from year to year might be reason you found the pike in north end of lake I heard water levels were up this year. Thanks, I enjoyed the read. An excellent read, thanks! Congratulations on the fantastic fish; I'm glad things worked out for you. Not a bad opening chapter to your new saga! You're right. That is a long story. Nice job on the fish and a well written fish story! Beautiful fish, thank you for sharing the story and pictures.